©1990 Paramount Pictures. All rights reserved. 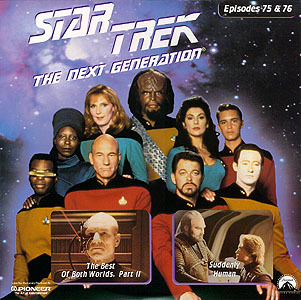 After Captain Picard (Patrick Stewart) has been captured by the Borg and transformed into one of them, Starfleet promotes Commander Riker (Jonathan Frakes) to Captain of the Enterprise. The Borg have now absorbed Picard's knowledge of the Federation, enabling them to decimate a Starfleet armada and continue on to Earth, where they intent to enslave humanity. Riker realizes the only hope is to tap into Picard's knowledge of the Borg and turn the tables. 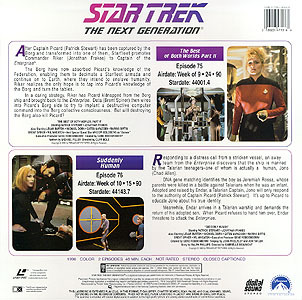 In a daring strategy, Riker has Picard kidnapped from the Borg ship and brought back to the Enterprise. Data (Brent Spiner) then wires into Picard's Borg side to try to implant a destructive computer command into the Borg collective consciousness. But will destroying the Borg also kill Picard? Responding to a distress call from a stricken vessel, an away team from the Enterprise discovers that the ship is manned by five Talarian teenagers - one of whom is actually a human, Jono (Chad Allen). DNA gene matching identifies the boy as Jeremiah Rossa, whose parents were killed in a battle against Talarians when he was an infant. Adopted and raised by Endar, a Talarian Captain, Jono will only respond to the authority of Captain Picard (Patrick Stewart). It's up to Picard to educate Jono about his true identity. Meanwhile, Endar arrives in a Talarian warship and demands the return of his adopted son. When Picard refuses to hand him over, Endar threatens to attack the Enterprise.